If you enjoy drinking coffee or eating fruit, it’s highly likely you’ve consumed products exported from Honduras. Indeed chances are a good part of your wardrobe was cut and sewn there. Yet, many consumers would be unable to point out Honduras on a map. This small Central American nation has been a Western ally and trading partner for two centuries, but is facing a crisis. A crisis that, like the nation itself, is being largely overlooked by the international media. Ask ten people to name the most dangerous country in the world, and you’ll get a variety of answers, ranging from Syria to Iraq and Afghanistan. Perhaps viewers of Narcos would guess that it’s Mexico or Colombia. However, they would all be wrong. Honduras has the highest murder rate on the planet, and it’s getting worse daily. The violence isn’t limited to foreign tourists. Journalists, women, members of the LGBT community, and casual bystanders are all fair game in Honduras. Murder has almost become sport, and the nation’s government, theoretically a democracy, is far too corrupt to effectively do anything about it. Recently, there has been no shortage of news detailing the political situation in Venezuela, as the United States and many other countries have declared the re-election of president Nicolas Maduro to be illegitimate. Protesters have poured into the streets of Caracas, supporting the opposition leader, Juan Guaido, who the U.S. has recognised as the nation’s interim president. However, when a nearly identical situation occurred in Honduras at the end of 2017, it hardly received any media coverage. While the Organisation of American States questioned the validity of Juan Orlando Hernandez’s re-election, the United States accepted the results and offered little support to the thousands of Hondurans who had risen in protest. Government corruption isn’t new to Honduras, but the Hernandez presidency has taken dirty politics to new levels. The president was earlier forbidden by law to run for re-election, but the law was overturned by a ruling of five Supreme Court judges, all of whom had been appointed by Hernandez. The presidential election was held in November of 2017, pitting Hernandez against opposition candidate Salvador Nasralla. As the votes were being counted, Nasralla was in the lead and headed toward victory before the counting was suspended, with Hernandez eventually being declared the winner. Hondurans went to the streets in protest, until the president ordered a military crackdown. A few foreign news services broadcast scenes of protesters being tear-gassed, but for the most part, the events went largely unnoticed outside of Honduras. An organisation called the Committee of Relatives of the Disappeared in Honduras reported that at least 22 people were killed while many others disappeared and haven’t been seen since. Upon being elected to his first term, Hernandez had talked tough, promising a zero-tolerance policy against gangs and narcotics traffickers. And yet, the president’s own brother, Tony Hernandez, was arrested by the U.S. Drug Enforcement Agency in Miami this past November, charged with trafficking cocaine into the United States. Tony apparently took a great deal of pride in his product, as each bag of cocaine was stamped with the initials, “TH.” Tony Hernandez was even heard on tape setting up protection for drug shipments within Honduras. Some of the shipments were escorted and protected by the Honduran National Police. On top of this, Honduran gang violence is out of control. The slums in the city of San Pedro Sula have become a hell on earth, as even young children are pulled into gangs, running errands before “graduating” into becoming full-fledged members. Robbery and kidnapping occurs openly on the highways and city streets. These are stories I have even heard firsthand, from relatives and family in Honduras. In one instance, my sister-in-law was robbed aboard a bus, along with all of the other passengers. For many, this is an everyday occurrence in the cities. On another occasion, the family was terrified that my wife’s brother had been kidnapped while on a business trip. After not being heard from for several hours, we breathed a collective sigh of relief upon learning he had merely been without cell phone reception. The threat of kidnapping is serious, especially for anyone who appears to have financial means beyond destitution. Nearly all private homes are protected by high walls with barbed wire or shards of broken glass on top to keep intruders out. Indeed this all plays out in a country with soaring economic inequality, where a vast majority of wealth is centralised, whilst huge swathes of the populace are destitute. It has the 16th highest inequality rate in the world (some 90 places above the UK) – with a GINI coefficient rating of some 50%. Cities like San Pedro Sula are defined by massive urbanisation, slum housing conditions and hugely widespread under-employment (some one third of the population as a whole). For its entire existence, Honduras has enjoyed a strong relationship with the United States and most other countries in the Western world. During the Cold War, Honduras was talked of by the US as a beacon of democracy. However, what is occurring now seems to be a heinous perversion of that democracy. President Hernandez has gradually consolidated his power, appointing friends and family to key positions in the government. With such widespread corruption, for many citizens in Honduras democracy seems to offer no solution to their awful sociopolitical conditions. When elections like the one in 2017 don’t carry out the will of the voters, this feeling can only grow. The current situation in Honduras is eerily reminiscent of the Somoza dynasty in neighbouring Nicaragua. That corrupt dynasty would be toppled by the Sandinista socialist revolution, and followed by years of civil war and human rights abuses. 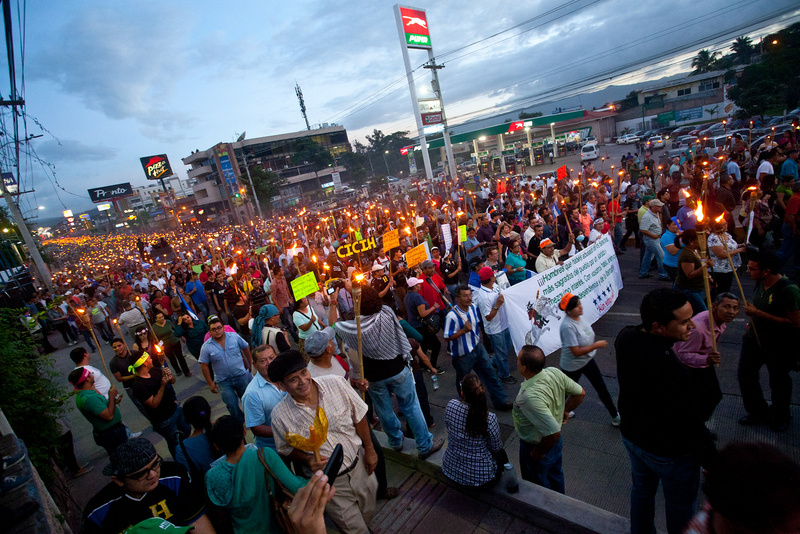 Whether such a future is in store for Honduras hangs in the balance. The question now then, is one of whether the struggling society of Honduras can avoid collapse without the help of an intervention to defend its democracy. For that to happen however, people outside Honduras need to start watching.